I was asked if I could do a tutorial on drawing noses, so here it is. I put this together rather quickly, so if you have suggestions on improvements, I'm glad to hear it. For a full tutorial on drawing a human face, take a look here. 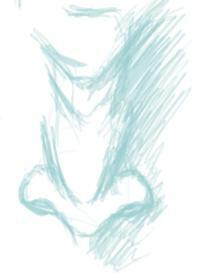 The human nose is tricky to draw for a variety of reasons. The most prominent one is that the nose (at least when seen from the front) has few clear lines to it. Apart from the nostrils and the wings, our nose is just a smooth ridge in the middle of the face. This makes it hard to portray using line-art for example. There is a reason many comic styles reduce the importance of the nose in the face by only marking the nostrils or even removing it completely. Drawing the nose wrong is a common mistake that will make the face you draw look very weird and ugly. So it's tempting to just make a simplistic iconic nose on your characters. The whole manga style is based on this simplification. Thing is, people have nice big noses in their faces. That's the way it is. If you saw someone with a "manga style" nose in real life you'd think that to ugly and almost scary (certain heavily surgically altered popstars come to mind). Look at a supermodel and you'll realize she (or he) does look beautiful despite showing off that big nose in all its glory. 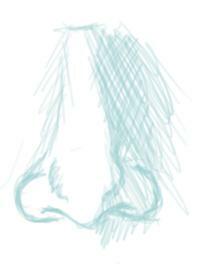 For that matter, there are people who's noses make them beautiful. 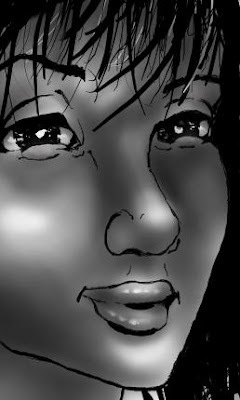 The bottom line is, the nose is an important part of how we look, even if you draw in manga style you should at least know what it is. Once you do, simplifying it is just a deliberate style choice and not something you are forced to because of laziness or lack of skill. In this tutorial -- which is more like a small anatomical lesson than a step-by-step tutorial, really -- I'll try to show how an anatomically correct nose looks like and to give some hints on how to draw them. You won't need much GIMP skills for this one -- the airbrush at 50% opacity is what I've used here ... these skills you can train on paper just as well. All the thumbnails below are clickable. 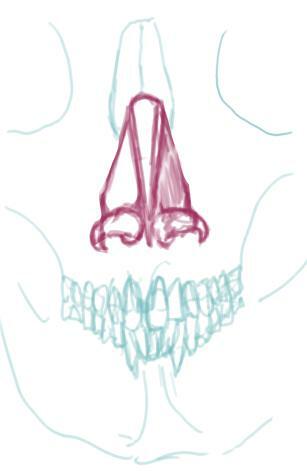 The nose is a set of cartilage surfaces (purple) attached to the nose bone and skeleton surrounding it. 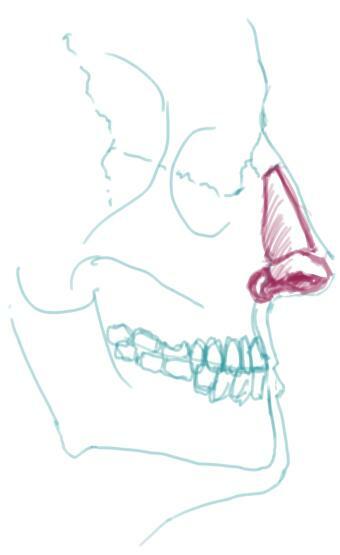 The actual skeleton ends around the base of the nose and is essentially just a hole in the skull -- on top of that there's only a build-up of cartilage -- that's why the nose is pretty flexible (you can feel with your fingers on your real nose where the skeleton ends around it). The side-cartilages make up the sides of the nose ridge, and there are also two wing-cartilages that are there to form the nostrils. Over it all there's a thin layer of muscles attached (that's why you can wrinkle your nose and expand your nostrils for example) as well as skin, smoothening out the shape of the nose to become what we see from the outside. 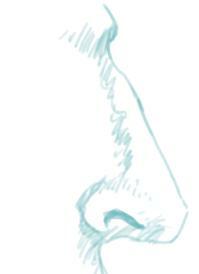 Think of the nose as a sort of reversed chimney with two openings, angled out from the face. Its job is to take in air through the nostrils and funnel it into the nasal cavities in the skull where it can reconnect with the throat. Behind the nose (behind, as in "into the head") are the nasal cavities, each connected to a nostril for air intake. The cartilage separator runs along the center of the nose. It's pretty stiff (this is what you feel if you strike over your nose ridge). It goes from the surface into the depth of the nose and separates the two nasal cavities from each other. The cartilage separator is what keeps the nose sticking out from the skull too -- it's sort of like a wall holding up a tent of cartilage and skin on either side of it. ... Well, that's all the anatomy you'll get for now. It helps to know what it is you are portraying, and what everything does -- there's a reason the nose wings look the way they do, or the nostrils could not be held open, for example. Worth thinking about. The nose, as with all human features vary greatly in shape and form, both between different nationalities as well as between individuals. As long as the basic anatomical features are there, you have pretty much free leeway to make your nose fit your character. 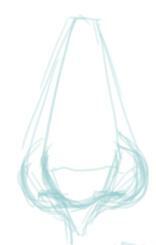 In the remainder of this tutorial I will draw the nose on its own. But it helps to know where it's supposed to go. The nose starts about in the center of the face -- using the exact center is often a very good approximation. It dominates a large portion of the face, really. The nostrils are about as wide as an eye. 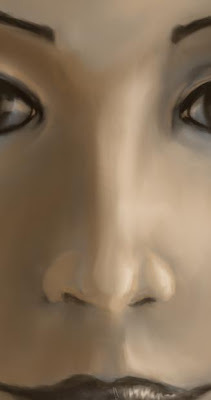 I already described the positioning of the nose in the portrait tutorial, so I won't go into any more details here. Ok, enough theory, let's get practical! 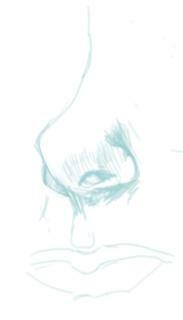 Drawing the nose from the side is much easier than drawing it from the front, since you have a clear outline to follow and don't have to worry about the stretch of skin or the 3D-form of the nose in the same way as you have to do from other angles. In the following I give a few examples. I suggest you try to copy them on your own, thinking of the various features that make up the nose. 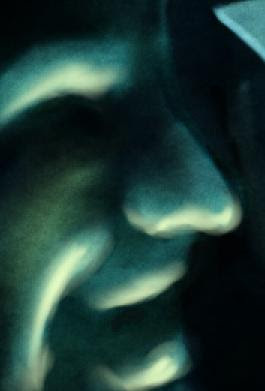 This is a male nose, with a slightly bent ridge. More extreme, sloping "hawk" nose. The nose of old wizards and warlocks. Older people often develop a more or less sloping nose. This is because the nose, just as the ears, never stop growing for a human. Skin and cartilage also tend to loose their firmness with old age, enhancing the sagging of nose and ear lobes. Up-nose. 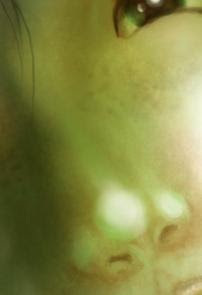 Many comic-book females have noses like this or even more extreme. This is also a common asian feature. It's more tricky to draw the nose from the front, mainly because of the non-existence of a clear outline over the ridge. Some shading technique is needed to show the correct form. If we try to remember the 3D-form of the nose things will get easier. Let's try it step by step. 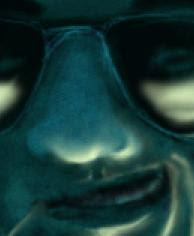 See if you can duplicate the nose shown below. If that went well, try some variations. A nose can look in so many ways. Try to mimic your own nose, for example. Make a simple "block" protruding from the face -- give it edges and an underside like above. The actual shape varies greatly depending on what nose you want. Here I have a verybroad nose ridge -- a strong, wide nose. A thin nose ridge will change that. Remember always that you are looking at something which has volume -- the nose is not a flat thing, it's really pointing out towards us. Also remember that we won't be able to keep these clear structure lines later -- they are only there as help lines for now. 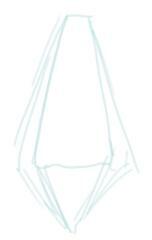 Make the outlines of the sides of nose wings. Mark the nostrils, and make sure to mark the tip of the nose. At this point you will now have to go into shading, working away from the straight lines. 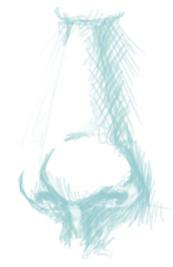 Building on the previous sketch, here is an example of a nose with some shading in place. 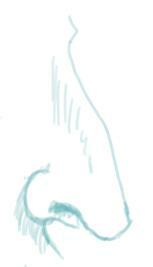 It can sometimes be a nice trick to make a small horizontal line over the tip of the nose. This gives the impression of a slight up-nose, if that's wanted. Other variation of nose, seen straight from the front. This basic form is good as a basis for a generic nose. Just remember that you cannot mark the ridge without using shadows. See if you can copy this one. Go back to the noses you sketched from the side and try to imagine and then draw how they would look from the front. The nose has muscles too, and when a person gets furious or panicked, the brow will wrinkle and the nostrils will be pulled up to let more air in. 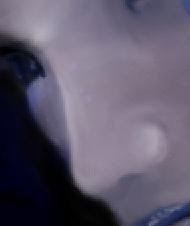 Once the shape of the nose has been understood, one can start angling the camera to view the nose from other directions. The colouring of the nose is a separate skill and whereas I won't cover it here (it's covered in the already mentioned portrait tutorial), the ideas are basically the same. In some ways it's actually easier to shade in colour because you have the added help of different colour tones. Hope this was useful for those of you interested in anatomy and painting.